Albuquerque, New Mexico. April 16, 2015: Optomec, a global supplier of 3D Additive Manufacturing systems, announced today that the Company has expanded its current distribution partnership with Ceradrop, a MGI Group company. Under the expanded agreement Ceradrop will now integrate core Aerosol Jet Sprint technology into their line of inkjet printers while continuing their role as reseller of Optomec standard Aerosol Jet systems in France. Aerosol Jet, combined with Inkjet technology, brings new and complementary capabilities permitting printing of finer features and processing of a wider variety of materials all in a unique digital material deposition platform. Aerosol Jet printing utilizes an innovative aerodynamic focusing technology that produces electronic and physical structures with feature sizes from 10 microns to millimeters. Aerosol Jet technology can also process a wide range of commercially-available materials used for printing electronics, including nano particle conductive inks, diluted thick film pastes, thermosetting polymers such as UV-curable epoxies, and solvent-based polymers like polyurethane and polyimide. These Aerosol Jet capabilities deliver the precision and flexibility required to produce electronic devices such as conformal antennas, sensors, thin film transistors, and other components for applications in consumer electronics, automotive, aerospace and the Internet of Things. For more information on Aerosol Jet technology, click here. Ceradrop designs and markets Materials Deposition Digital Printers exclusively for the Printed Electronics Industry and Smart 3D Printing. As the subsidiary of the MGI Group, focused on Printed Electronics and Smart 3D Printing, CERADROP can call up more than 60 engineers specialized in inkjet engine, mechanics, automation, software, chemistry, and ink management. This allows Ceradrop to supply the best materials deposition digital printing solution, from advanced R&D up to 24/7 high performance manufacturing including photonic curing and high throughput manufacturing capacity of several m²/min. Achieving more than 60% of its turnover from export and providing a unique process support to its customers, Ceradrop makes it easier and more efficient to use Digital Printing technology for Printed Electronics and Smart 3D Printing in worldwide manufacturing. Optomec is a privately-held, rapidly growing supplier of production grade Additive Manufacturing systems. 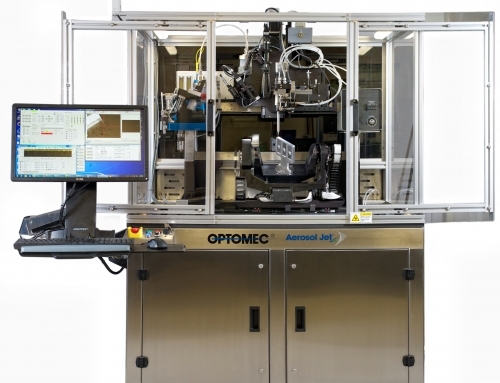 Optomec patented Aerosol Jet systems for printed electronics and LENS 3D Printers for metal components are used by industry to reduce product cost and improve performance. Together, these unique printing solutions work with the broadest spectrum of functional materials, ranging from electronic inks to structural metals and even biological matter. Optomec has more than 175 marquee customers around the world, targeting production applications in the Electronics, Energy, Life Sciences and Aerospace industries.